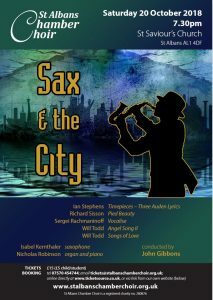 Contemporary music for saxophone and voices. In the 1840s, Belgian instrument maker Adolphe Sax set out to invent an instrument that could combine the agility of the woodwinds with the power of the brass instruments, to fill the vacant middle ground between the two sections. The result was the saxophone, nowadays said to be the instrument that most closely resembles the human voice in terms of richness of harmonics and expressivity. Our concert showcases three pieces for alto saxophone and voices, along with two choral works by our president, Will Todd, and other lighter pieces with a city theme. Timepieces – Three Auden Lyrics (2011) by Ian Stephens sets three poems by WH Auden (Domesday Song, Our bias and Funeral Blues) for alto saxophone and SATB choir. Richard Sisson set Gerard Manley Hopkins’ poem Pied Beauty for the choir of Merton College Oxford in celebration of their 750th anniversary in 2015. It uses alto saxophone and organ. Vocalise (1915) by Sergei Rachmaninoff is a song without words, sung using any one vowel of the singer’s choosing, and has been has been arranged for many different instrument combinations. We will be performing it in an SATB arrangement with alto saxophone and piano. Will Todd’s Angel Song II (2008) is part of a larger choral work inspired by the idea of voices from heaven. It is another wordless piece; the text is designed to create the echo of the word ‘hosanna’ but with no consonants, so that the music feels as if it comes from ‘on high’. Songs of Love (2012) sets three works by the Greek neo-romantic poet Maria Polydouri: I Love You, A Kiss and I Sing Because.